No doubt about it, in rough, slippery conditions, a wider footprint rules, Period. Plus, Midfat or Plump bikes are becoming more and more common and with good reason. I had a chance to put one through its paces in Whistler during Outerbike and here are my initial thoughts after a few hours of riding. 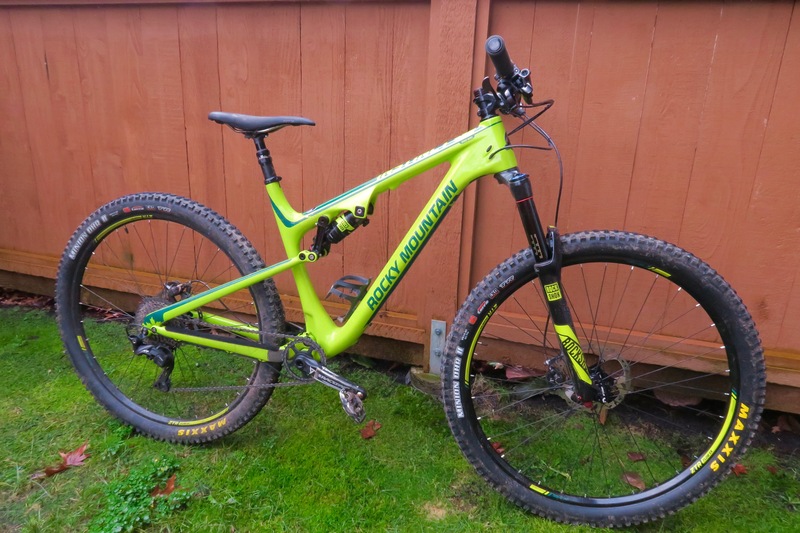 The Pipeline is based of the Instinct, which is reviewed below, and is in my opinion, the most versatile trail bike on the market (Specifically when supplied in the “BC Edition” with wider wheels, bars and a Pike with 140 mm of stroke). The Pipeline uses only the front triangle and the design team at Rocky came up with a redesigned rear triangle to house the larger 2.8″ Wide Maxis Rekon+ tires. 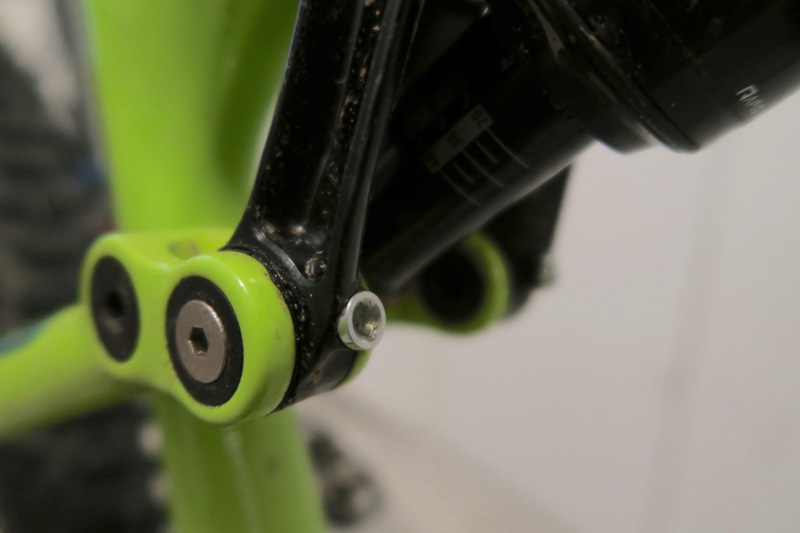 The frame uses the Rocky BC2 Greasable links, but had a conventional ball bearing main pivot since it re-uses the older frame style. This article is not going to be another rant/discussion/spew about wheel sizes and what is better and how great (they are) or outdated a 29er is. This is going to be a (mostly) objective look at the details that went into the latest Instinct and my take on how it all stacks up. The Instinct has been a very successful model line for RMB, I have personally had a few bikes in this category: Santa Cruz Tallboy LTc, Scott Genius 970 and a whole slew of shorter travel XC-ish 29ers. This Instinct is by far one of the best spec’d and capable rides for the pacific northwest. No matter what bike you are on, there will always be compromises in performance at some point for certain types of trails, simply put: different bikes are suited to climbing vs descending, cornering vs rough roll ability etc. There is no such thing as a “perfect” bike, just maybe one more suited to the conditions you are riding at that exact moment. I won’t bore you with the build specs, chances are pretty good that if you are reading this review, you have already found the specs on Rocky Mountains Wesbite: www.bikes.com. What I will do is highlight some of the important points. Stans ZTR Flow EX tubeless wheelset laced into the latest 6-pawl Stan’s NEO hubs—An exceptional wheel set delivering lightweight, performance and value. These are not some precious $2000 carbon nano hoops, and if you manage to mangle a rim beyond fixing, it can be replaced for around $125. 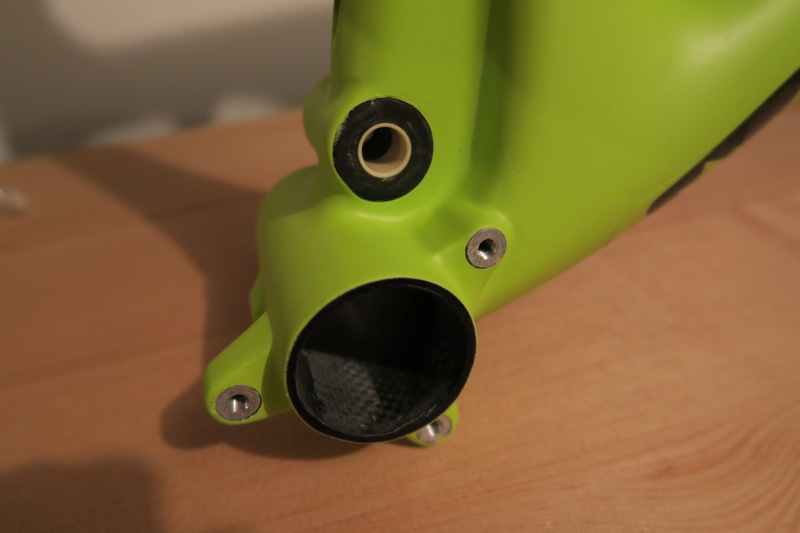 125 mm Rock Shox Reverb (I have a love-hate relationship with this seat posts function vs reliability). For my proportions and saddle height, I would prefer to see a 150 mm travel since I have enough space above the collar and it would allow me to slam the seat even further down for those ever so sweet near vertical granite slab descents. 140 mm Travel Rock Shox Pike.—The benchmark trail fork on the market right now. 60 mm RMB Stem—Shorter stem, more precise handling, more confidence on the steeps. 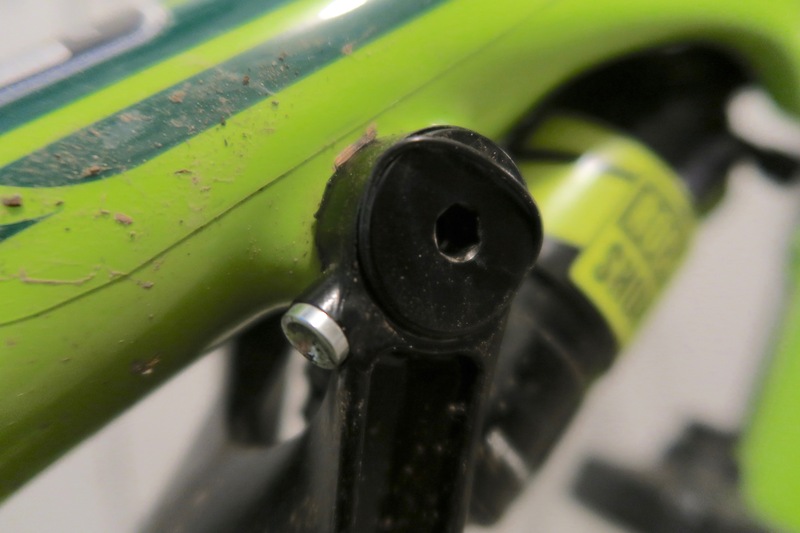 This seems like a cost-decision, earlier models had a RaceFace Turbine Stem. Custom valved Rock Shox Monarch RT3 shock. I have two gripes based on the factory assembly/packaging, the first being that the rear 12×142 axle was very slightly cross threaded into the frame nut and now causes the threads to bind slightly when you try to re-install the axle. 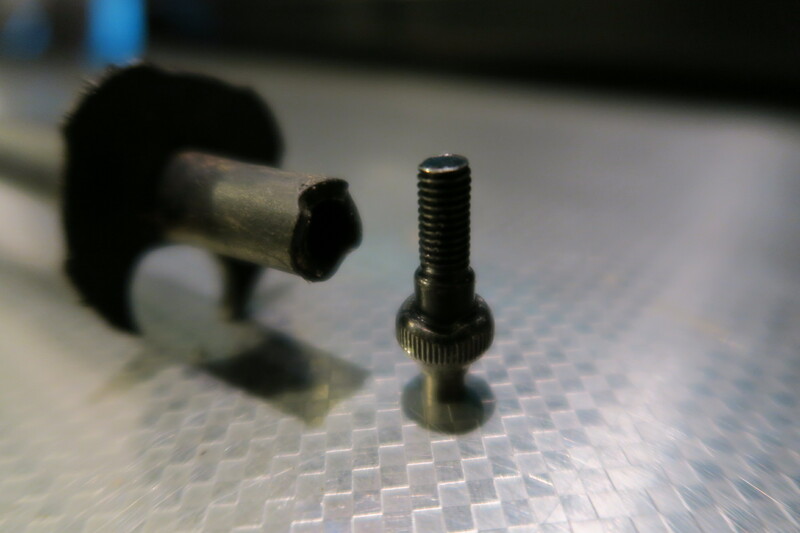 Its enough that when you apply force to get it to engage, if you are not careful, the nut pops out of the frame (a 1.5 mm setscrew can only support so much side loading). Note the tiny 1.5 mm set screw above the rear axle. 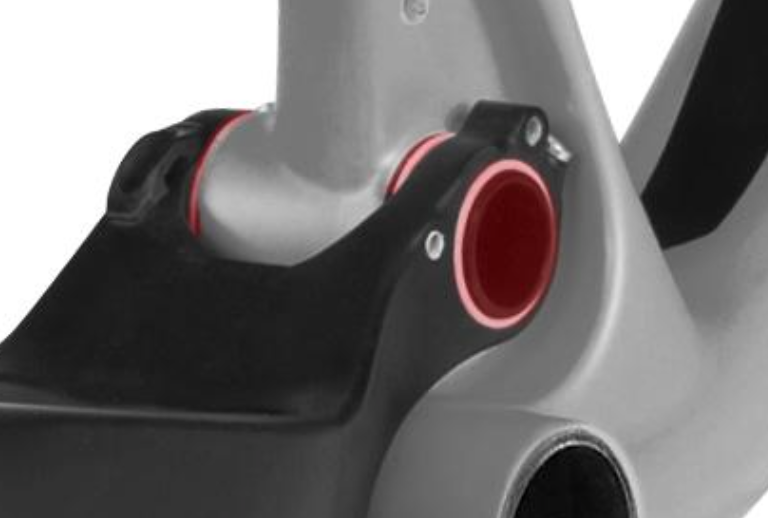 Horst link style pivots provide a very stable, progressive feel to the rear suspension. Direct mount derailleur is welcome. 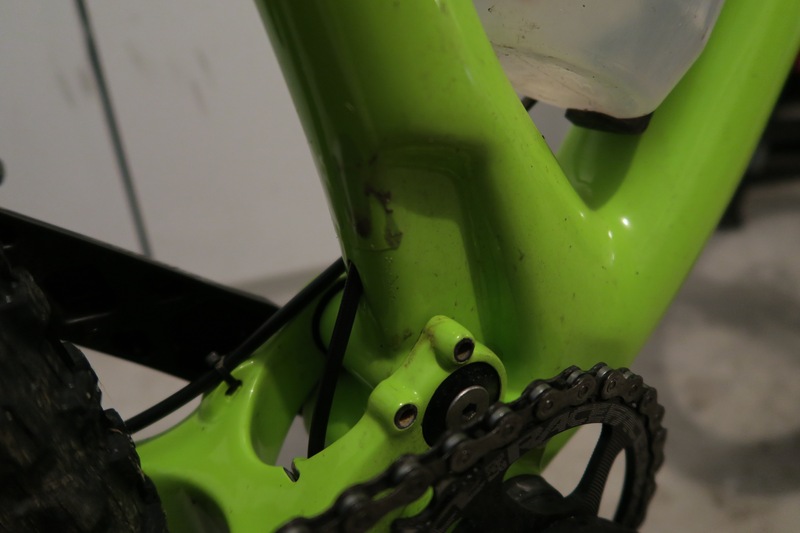 The second gripe being a nice factory applied paint chip right on the top tube in a section of contrasting paint–hard to ignore and a bit disappointing right out of the box. The bikes are very well wrapped in two layers of bubble wrap, cardboard and foam protection so it is not likely and shipping and handling type of damage. I’d like to apply my own paint chips thank you very much. Recess on the front triangle for front derailleur clearance and mounting location on the swingarm near the main pivot. There has been a lot of concern with strength in the BB/main pivot location. I personally have seen this area fracture through the BB into the main pivot (previous models) and have had others see failure points above the main pivot location on the front triangle. Perhaps a redesign, eliminating the recess will allow a stronger, stiffer BB junction. 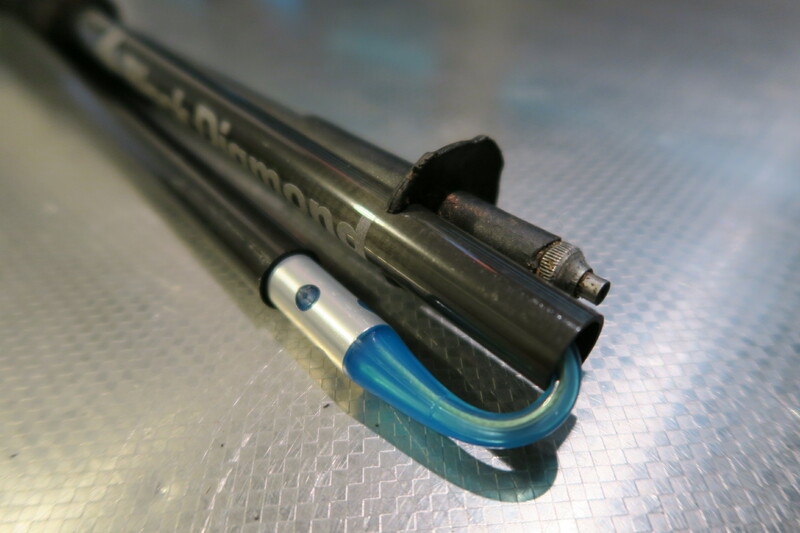 Below is a screen grab from http://www.bikes.com showing the Pipelock collet that was introduced with the Thunderbolt. The Instinct received the serviceable BC2 pivots, but a frame redesign incorporation the new main pivot design will have to wait. The Pipelock Collet has a larger diameter that should lead to less stress in this area. Carbon frames are made in expensive molds in overseas factories that are typically developed and amortized over a number of years. Changes to Carbon molds are expensive and usually only done for new models are complete re-designs of older models (the same thing really). The Instinct line-up if I had to guess, is probably tapering in the contribution to RMB’s bottom line in most markets due to the wild popularity of the 27.5″ wheeled platform, and therefore perhaps investments are being delayed viewing this segment as in its twilight. I however do not subscribe to that logic. Long travel 29ers are seeing a resurgence with the newer geometry and the short chain stays permissible with the absence of a front derailleur, and in certain markets, 29ers are the obvious choice. The top linkage driving the shock received the BC2 upgrade this year with the main benefits being serviceability and a small increase in stiffness. Flush-type SAE grease fittings are used to provide fresh lubrication and purge contaminants without the need for disassembly. I have found a poorly designed o-ring retention groove on the covers of these upper pivots. Right from the box, one of the o-rings was dislodged from the groove. And can be pulled out very easily by hand when fully assembled. The end caps were not designed with a proper standard o-ring groove, a redesigned cover, slightly larger in diameter with positive outside retention on the O-ring would solve this problem. Upper BC2 pivot with displaced O-ring. Lower BC2 Pivot showing flush-type SAE grease fitting and pivot hardware. 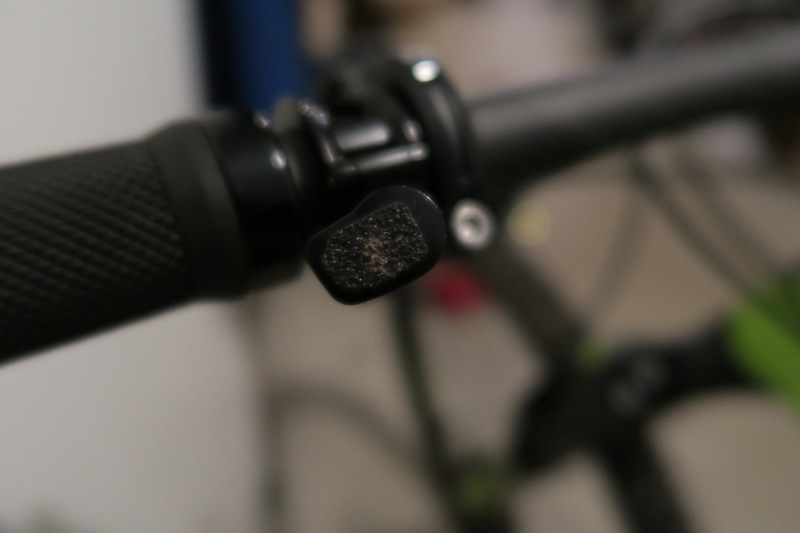 The absence of the left side shifter allows convenient location of the Reverb button. I have placed a self adhesive tab of grip tape on the button for traction. Anyone who has used these with wet gloves knows that they are fairly slippery and this little mod helps immensely. 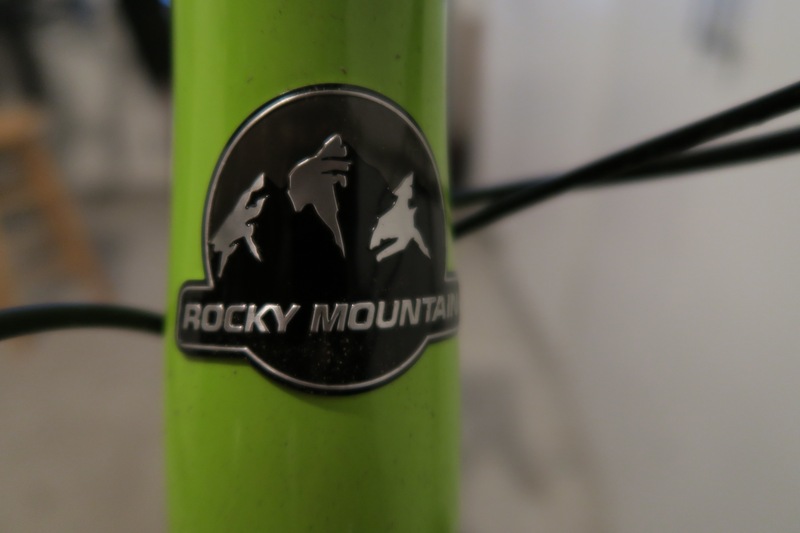 Rocky Mountain has also updated their head badge and removed the lower “Bicycles” to clean it up bit. 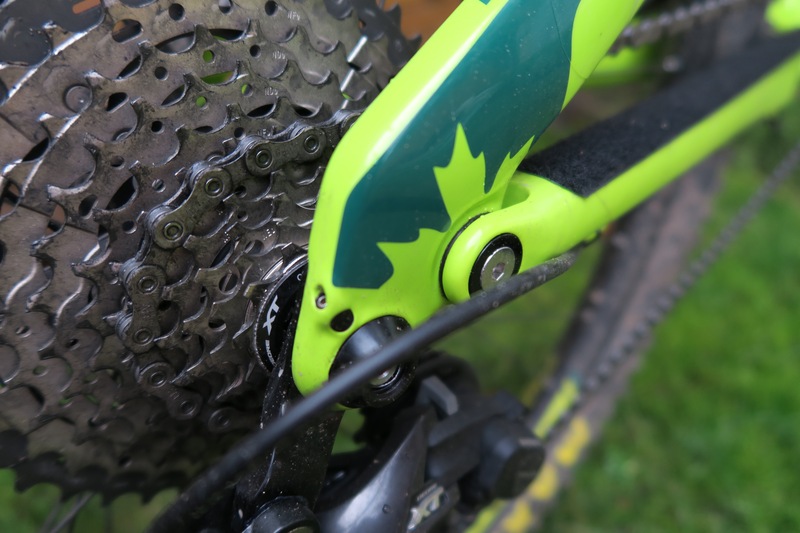 The new Stan’s Neo hub with ultra fast engagement and the 11-42 Cassette. I was super stoked, the new M8000 XT Gruppo brakes appeared to be a direct trickle down from XTR, almost identical to the XTR brother. 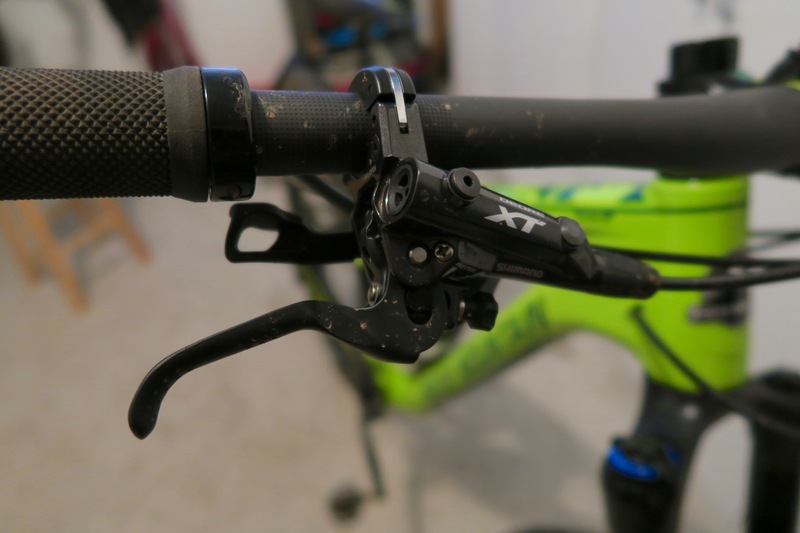 Basic feel and operation is great, but on no fewer than three sets of these, under increased and sustained braking effort they pump out, the levers reach further and further from the bar. I have three friends with identical bikes and they all have this issue…I have found similar experiences with these brakes while searching other initial ride impressions. I do not feel like it is a brake bleed issue on all of these sets, but consultation with Shimano should reveal the cause and solution. A Bare-framed look at the BB junction showing bushings (the main pivot rotates on ball bearings, these are used for the main axle contact) and ISCG05 chain guide mountain points. The ISCG05 tabs are also, in my opinion unnecessary. So much can (and will, I am certain) be done to clean up and strengthen this area. I have had the chance to put a number of hours on this bike since receiving it in early December. After coming off my Altitude Rally Edition the 29er felt like a thoroughbred on the climbs. This is by no means an XC rocket, but with more upright geometry, slightly longer stem (60 mm vs 50 mm) longer chain stays, and more tire contact, it is very well planted on loose climbs and allows you to remain in the saddle longer and climb more efficiently. 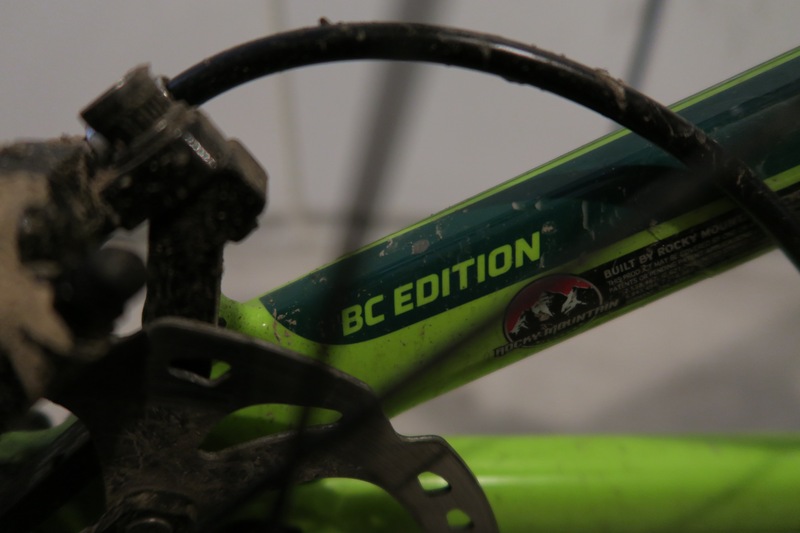 The Instinct BC Edition is marketed as “Aggressive Trail” which is i suppose self explanatory. It will however allow a rider to hold his own in a local “Aggressive XC ” style race, think Squamish or Whistler Toonies, Hell of a series and Nimby 50. I initially set the Ride9 chips to dead centre and then full slack, with the bolt located in the most forward-middle location. The climbs and root sections were great, with the instinct holding straight lines and popping over most obstacle predictably. Because of what I came from, a smaller wheeled endure segment bike, the downhill ride felt a bit twitchy but that is to be expected. Cornering however, was exceptional with traction (Minion DHF II F&R) holding fast. One of the most notable things about the ride is the extremely well tuned Monarch RT3 Shock. I have used Fox shocks for as long as I can remember, but after a number of rides, I am converted. The initial plush feel, spring ramp up and mid stroke compression of this shock is perfectly matched for the conditions I ride in. Air volume seems spot on with enough ramp up on big hits and jumps, it uses every part of the 130 mm travel very well and I never felt harshness at the top of the travel while running a compliant air pressure to maintain the initial plushness and sage that I prefer. Downhill I do feel a bit “perched” on the big Instinct, I’m 6′ tall and ride a size large, not that the frame size has much to do with that feel, it is just part of the nature of the long legged bikes and geometry. Gear selection is spot on ever with many sustained 20% + grades on my local trails, I was not wishing for easier gears, at least on shorter rides. On long rides when you are a bit knackered you can ALWAYS use an easier gear. 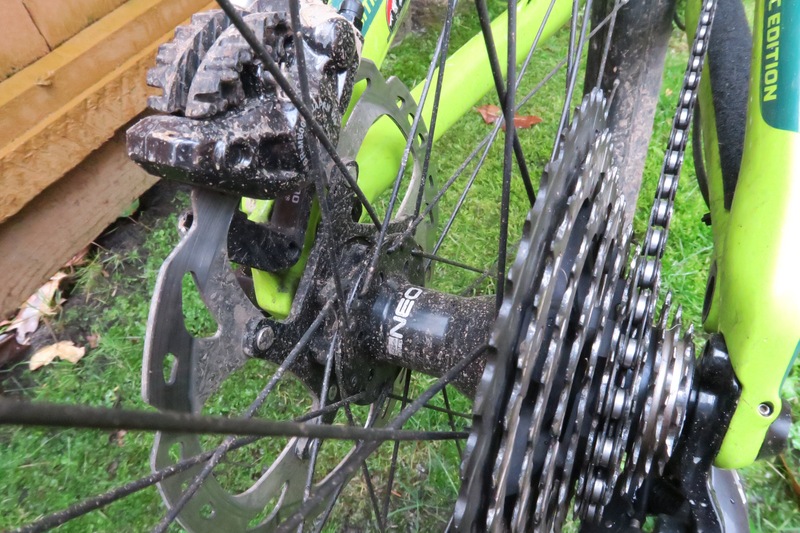 Race Face Cinch type Turbine cranks make changing rings fairly easy. Reasonable weight for this price point at right around 28 lbs. Very adaptable and universal trail bike–May actually be the most well rounded bike you will ride in terms of ups and downs, technical and smooth trails. Exceptional handling and combination of rear suspension stability, plushness and traction. Pipe Lock on main pivot would be a great upgrade. BC2 Pivot o-ring retention…This seems to be an oversight in design that could easily be fixed. For Steep, sustained descents, Trekking poles are a welcome aid to save the knees, add some stability and keep you upright. 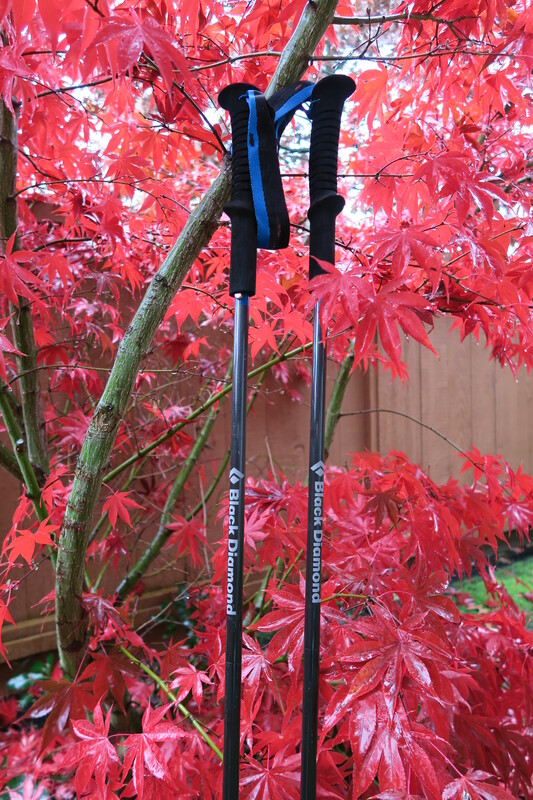 I received a set of the latest hyperlite poles from Black Diamond, their Distance Carbon Z Trekking poles. These are fixed at 120 cm length. Easily the lightest ski or trekking poles I have ever picked up, these things have shaved grams everywhere. 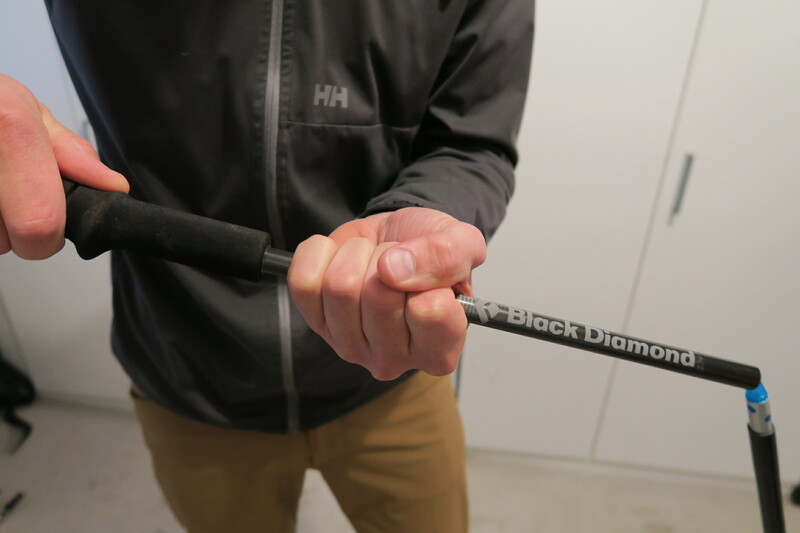 With the combination of a full carbon fibre composite layup, Kevlar string replacing traditional steel cable, and the high density EVA foam grips, these things feel weightless in your hand. 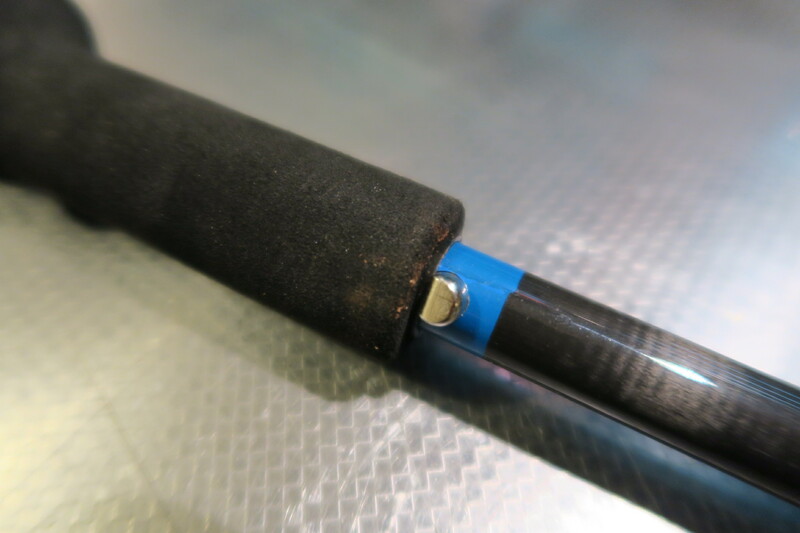 The Distance Carbon Z poles come with tiny trekking baskets and if you plan on using these for double duty as ski poles, then plan on installing some powder baskets, which may have to be rigged on since they are not readily compatible with any spare baskets I have seen. One handy feature is the groove in the basket that clips to the pole section when folded to help hold them together. Folded up these are just over 40 cm (16″) long. The poles come with two sets of tips, a set of hard rubber tips and a set of carbide ones. 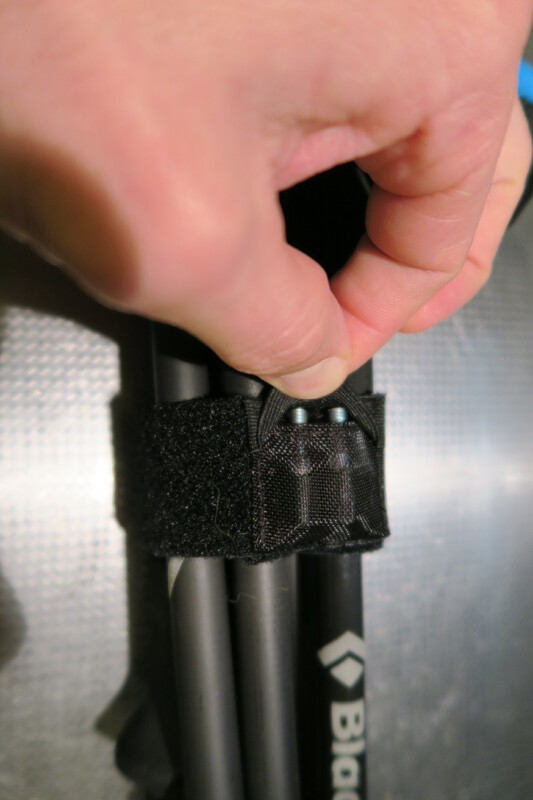 The spare tips sit in a small pocket that is sewn into the retaining strap. 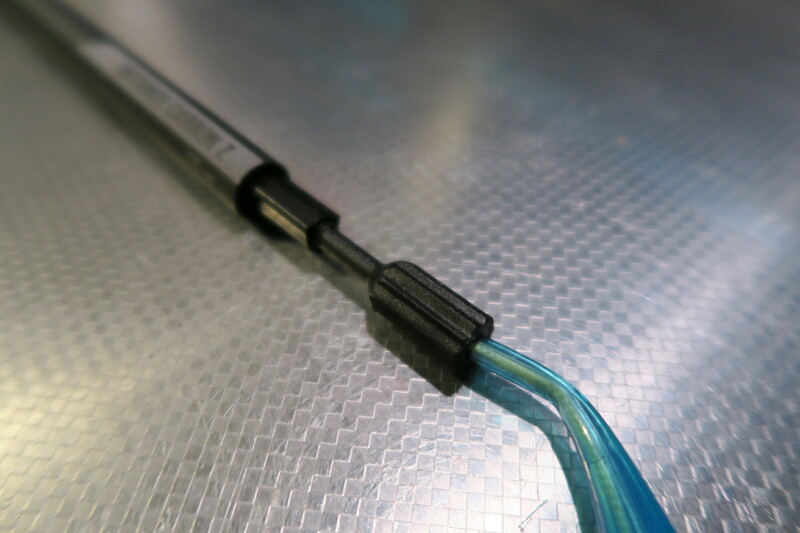 The tips thread into the ends and are held secure with a detent-style folded feature in the tip socket that mates to the tip once threaded in with pliers. I question the usability of the rubber tips as any use at all on hard rock, road or sidewalk surfaces would wear these away to nothing since they are very small. The EVA foam grips are extended below the main grip for fast hand position adjustments on steep or technical terrain. The grips use a thin, tapered adjustable webbing strap for your wrists, I personally never use straps, even when skiing so these will be removed for future use. Extending the poles is very much like deploying an avalanche probe where the sections are held all together with an adjustable (synthetic) cable and all you need to do is let the sections fall loosely, grab the top handle and the portion just below the grip and pull them apart. The poles lock into place with a positive clip that is similar to how an umbrella stays open. This button is easy to push with gloves on. The internal cable length is adjusted with a plastic or CFRP barrel adjuster to get the tension right and to compensate for stretch over time. The cable is covered with a clear-bluish soft plastic . This is the only piece that I can see getting abraded/cracking over time with extended use. With the cutting edge of ultralight gear, there are always trade offs. At a published weight of 290 G for the 120 CM length, The poles are available in 100, 110, 120 and 130 cm lengths. I really like the combination of compactness, light weight, comfy grips and ease of deployment. I have not used them long enough to comment on durability, but based on what I have seen, I would recommend these poles. The poles come in a set of two and are listed with an MSRP of $159 USD on the BD website. It has been said that the advent of GPS and mobile communications have had the effect to remove the true essence of adventure from our travels and wanderings. However, from my perspective, enhanced communication can have the opposite effect, where you can proceed with the assurance that contact with the outside world can be maintained. Adventure is generally defined as to engage in hazardous and exciting activity, typically involving the exploration of unknown territory, with at times, uncertain outcome. Critics will argue that tools such using satellite communication put more inexperienced people into harms way with a false sense of security allowing you to carry a tool to fall back on where you might not have proceeded before without a “bailout” option. 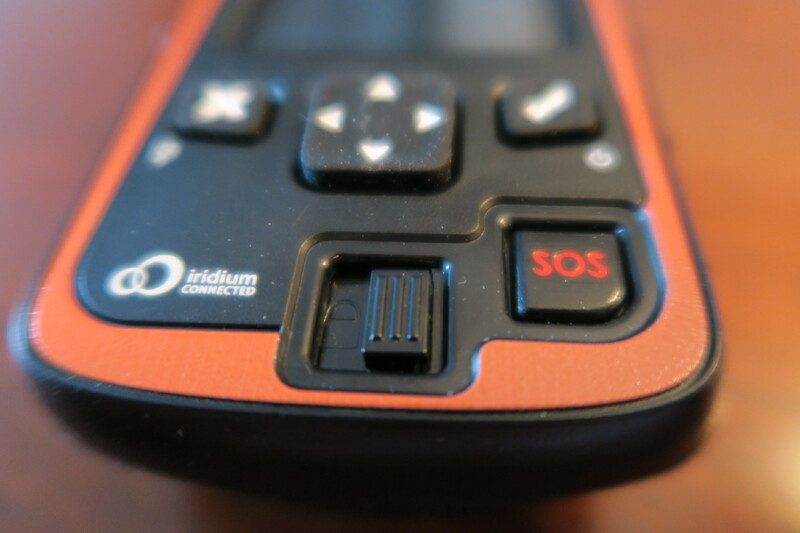 This debate could fill volumes and is not the focus of my post, but the actual general use and operation of the latest DeLorme inReach models is. 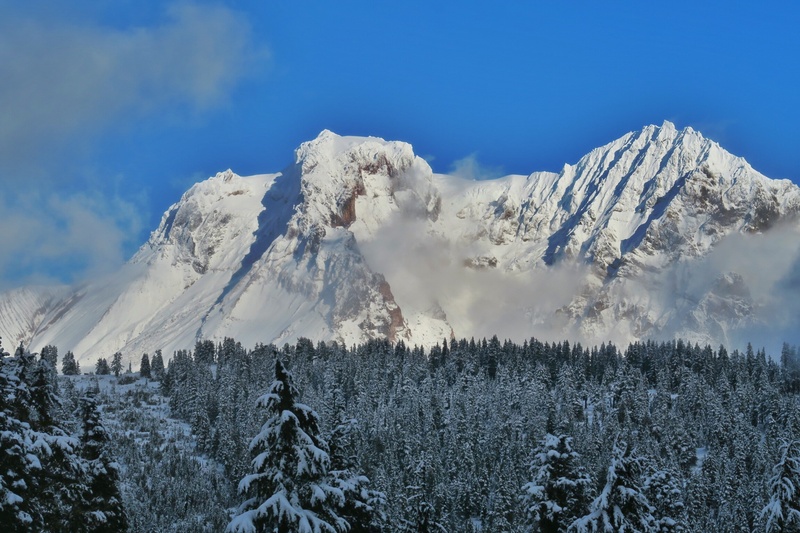 Mt Garibaldi, Dalton Dome and Atwell Peak in all their glory. At least two models have preceded the Explorer and the biggest differing feature of the Explorer vs the inReach SE is the GPS function internal to the handheld. First off, the overall build quality and assembly. In comparing with the current standard for electronics design and assembly, the inReach gets poor marks. It proudly advertises the fact that it is designed and manufactured in the USA but I find a few shortcomings. Materials: The housing is of what feels like much cheaper, more brittle plastic then what you may find on other outdoor electronic devices. 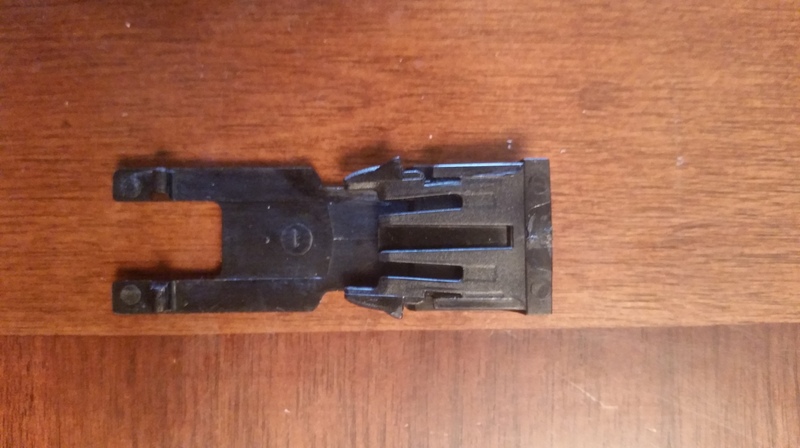 The plastic clip on the back, meant to attach the device to a belt, straps or whatever seems dodgy and I would not trust a $400+ device hanging of a $0.02 poorly formed plastic clip. The Micro USB cover is a combination of a plastic out cover and a rubber grommet that fits over the USB connection to provide a level of protection, I would hesitate to call this waterproof. The cover does not clip positively and you have to fiddle with it to get it set. 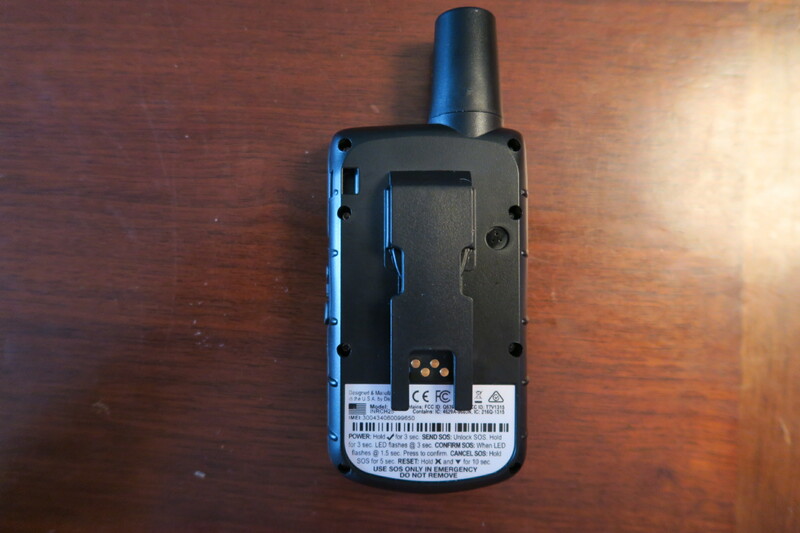 The overall size is about the same as Garmin GPS Map 64 or an old generation cell phone. Still small and light enough to be unobtrusive in your pocket. Buttons: There are four buttons including the X, Check, SOS and a four way keypad. The SOS button is hard plastic that is locked by a sliding switch. The other keys are soft rubber with recessed graphics that give a soft click when pressed. 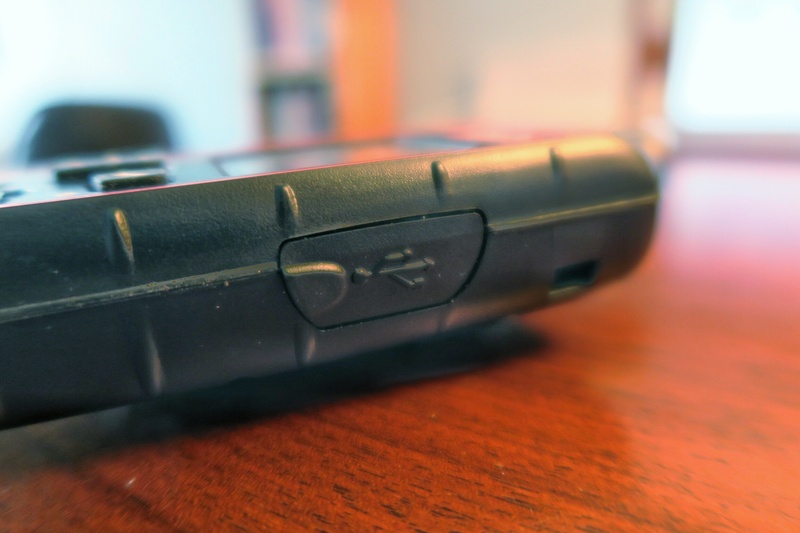 There is an acknowledgement for powering on (or off) the device to prevent inadvertent activation since the rubber buttons sit proud of the front face and are very easy to press. First off..who the heck would be dropping this onto Plywood? A useless test, concrete directly and stone would be the most real world testing, so take these test passes with a grain of salt for electronic devices since we all know that usually a drop onto a real world surface for electronics is most often crippling…Hang onto your electronics. Battery: The inReach uses an internal, non-removable Lithium Ion battery rechargeable through the micro USB slot on the side of the unit. The battery is spec’d at 2450 mAh (milli-Amp-Hours). Battery life will vary wildly depending on usage and screen brightness. I had one trip of around 4 hours of steady on, no GPS tracking but sending and receiving 4 messages and the battery indicator only went down 1 percent, much like a full gauge on a car, I find these gauges seem to go faster through the bottom half of the fuel than the top half. DeLorme states a 100 hr life with a certain tracking function to give a guideline. with basic message functions, I would assume the life would be much longer. Once plugged into a charger, it states the time it will take to reach a full charge, a nice feature. Screen: The screen measured 1-3/8″ x 1-1/8″ and is reminiscent of first generation GPS technology of about 20 years ago. This is a serious lag in the visuals department. I have a feeling that DeLorme has decided that the vast amount of users would be paring this unit via Bluetooth to a smartphone so they have decided for that reason and price, energy use and space to use a tiny screen with basic resolution. Brightness is adjustable in 25% increments and at 100% the screen is easily readable in direct sunlight. I don’t like having to juggle two devices so a better screen would be welcome. Input/Output Connections: Besides the obvious USB port used for charging and wired data transfer, there is an array of 4 contacts on the back of the unit under the removable pocket clip. These are not mentioned in the user manual and are likely the battery charge contacts for the RAM mount accessories. Back of the unit showing a basic usage guide and the four contacts. 2 way Communication: This is the absolute main and only reason that I purchased this unit. There are basic visual indicators that show you whether you have a strong or weak satellite fix (labelled as 2D or 2D) as well as a message indicator and a transmission indicator. navigating menus is reasonably straightforward and the layout is not customizable here either. In testing in mountain terrain, the messages seemed to send within a minute and received reply messages without issue. 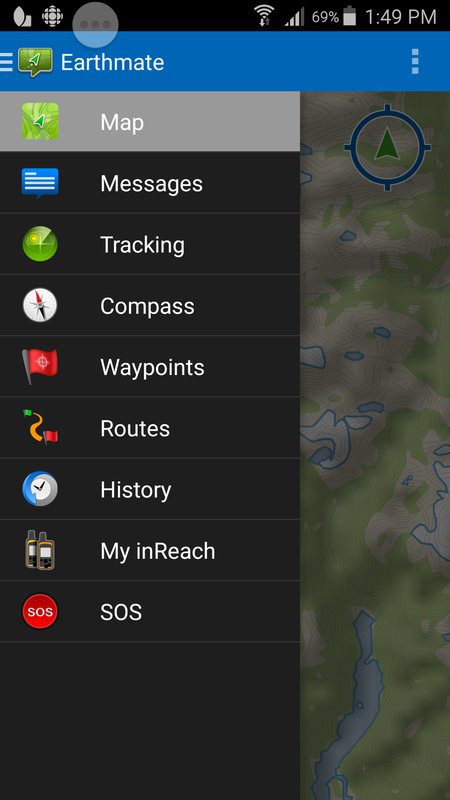 I did not test in deep cover of a ravine or thick forest canopy, but based on my experience with higher sensitivity GPS only units, I would take a guess that the inReach would likely take longer to send/receive in that terrain. You are allowed 160 characters per message and that seems to be plenty when communicating. Obviously not multimedia or other data can be sent, just text and position information. I have not had a chance to use the tracking function which serves to automatically upload your position data at preset intervals. You receive an inReach email address that people can email you directly to in the formal name@inreach.delorme.com, you can text to phone numbers or message to emails. 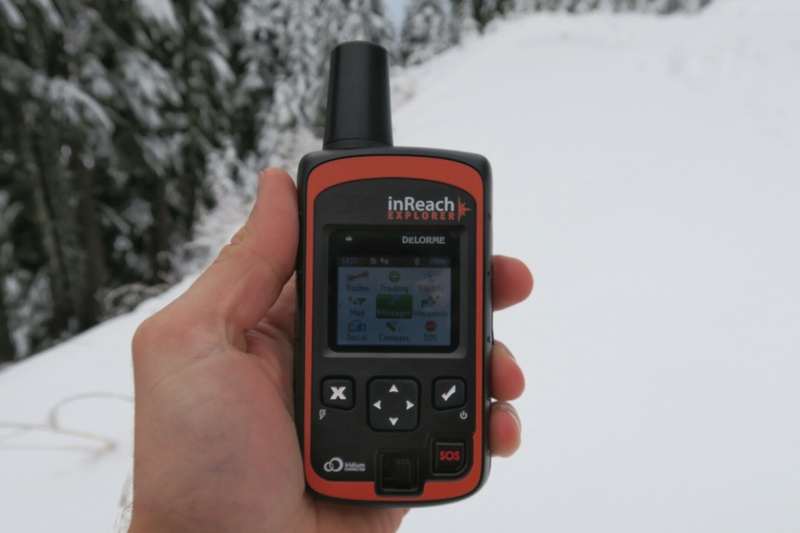 All in all, I would recommend this device for 2-way text communication over most other devices but it does not have much competition, I would however recommend to get the inReach SE over the Explorer for $150 less if you have other means for trip data tracking such as a dedicated GPS or a weatherproof smartphone. Check the Garmin GPS map 64s review on this blog. Weakpoints: Overall housing material quality, Poor quality pocket clip, Small screen size and resolution, Low GPS accuracy/reliability, Earthmate app Maps are not accurate. Strengths: One of the best (only?) 2-way texting device, Basic intended communication functions are done very well. 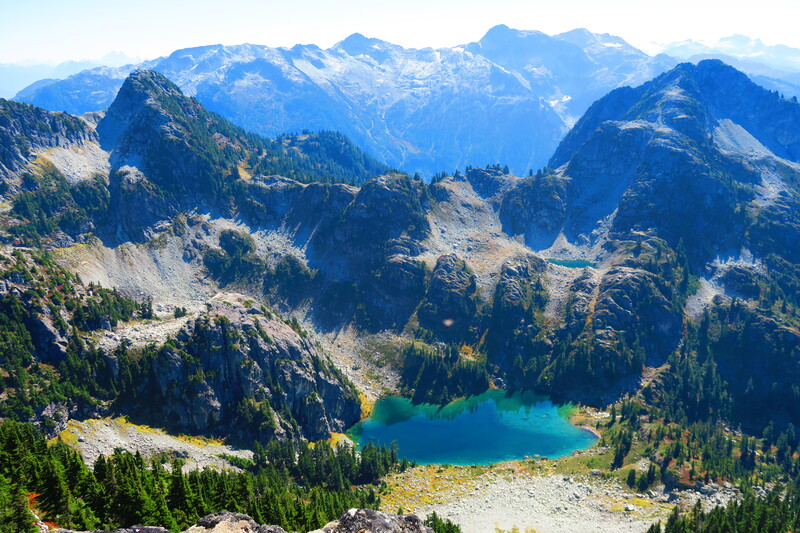 Watersprite lake is a lesser know sub-alpine glacial lake directly south of Garibaldi Provincial park and Mamquam peak. 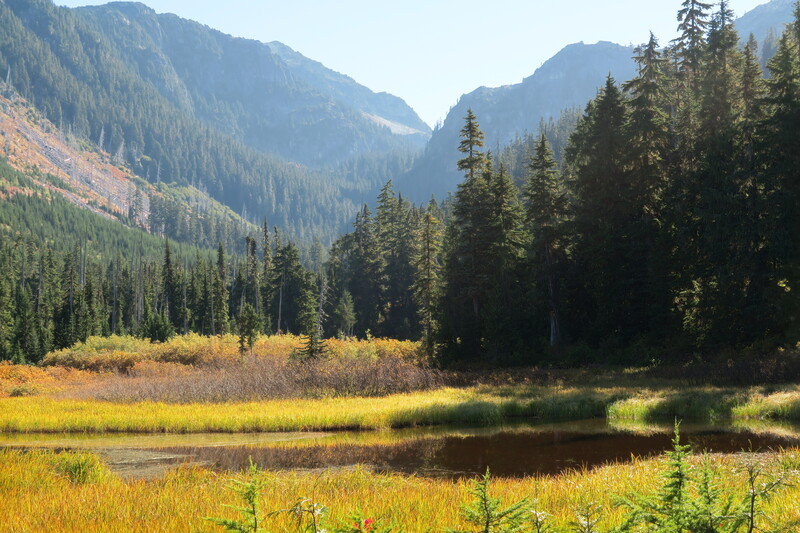 This area was once considered for a BCMC backcountry hut, but was put on the back burner. 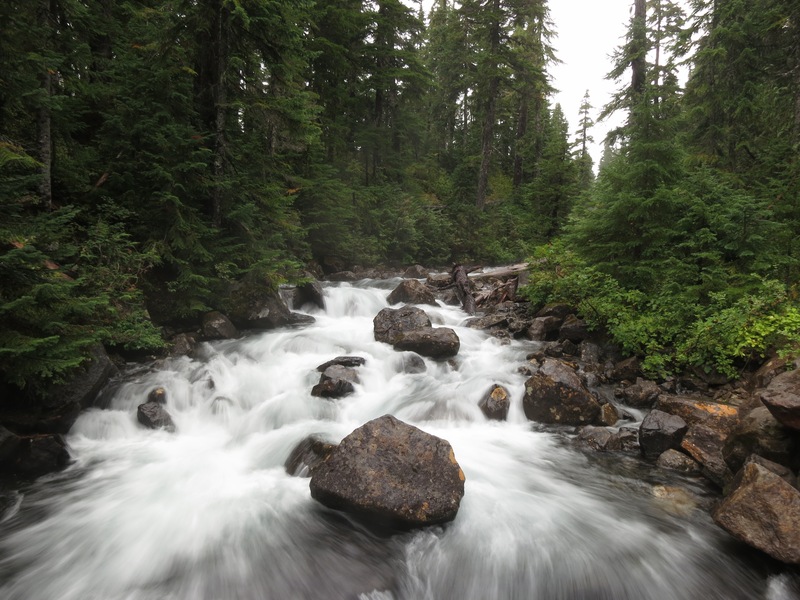 Rumours have it that it is now back up for consideration with the improved access from the Skookum creek power project and their service road that leads up skookum creek itself. 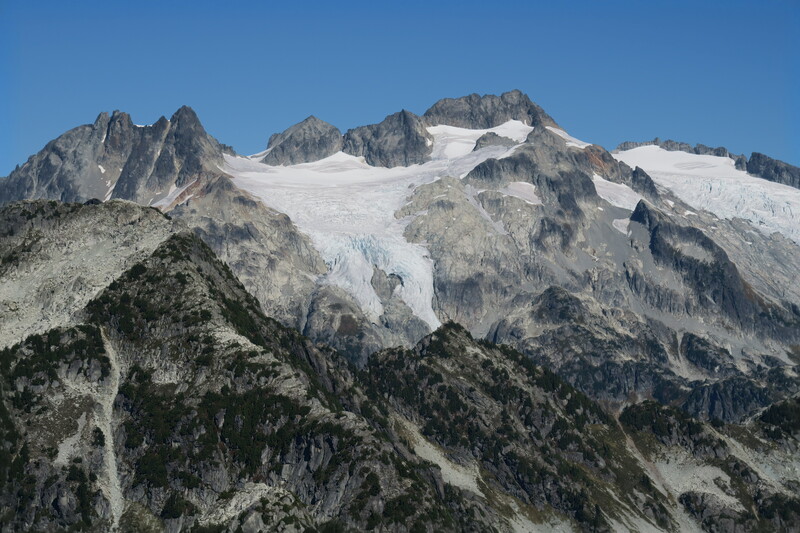 Martin Peak is the backdrop to the south of Watersprite lake and forms a talus filled bowl terminating at an 1800 m knoll on the west side and the Watersprite Tower to the North. This is an incredibly beautiful area and the absence of crowds (I had the whole area to myself) is a big draw especially with the proximity and relative ease of access from Squamish and Vancouver. 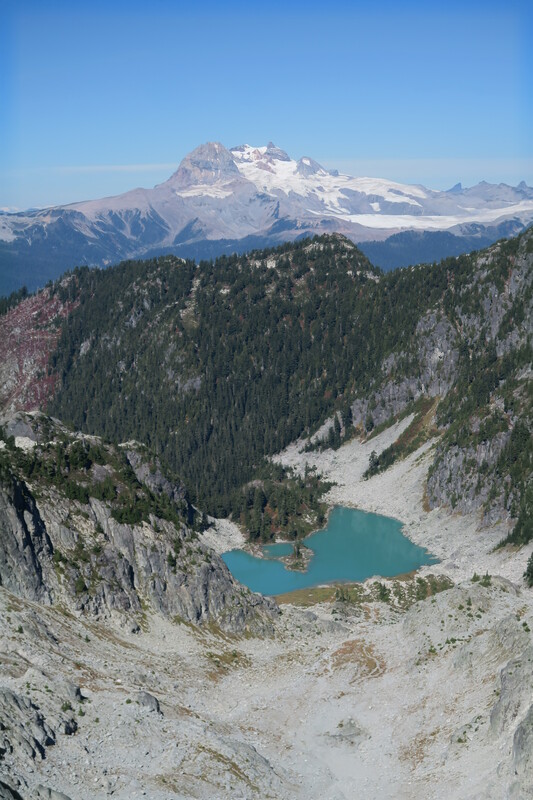 The most popular trail in BC (Elfin Lakes) was visible across the valley. The approach is made from the staging area and vent stack from the Penstock pipes for the Skookum creek power project. BCMC has erected a sign stating no Motorized use at this point. From the parking lot to the lake can be made in 2hrs flat, or less with a mountain bike (recommended). 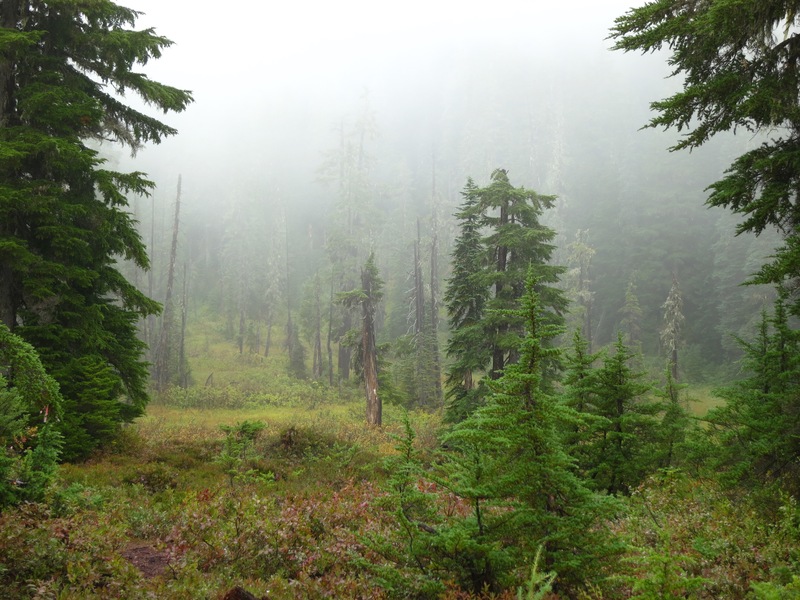 The first 5 km or so are on a logging road grade and then drops down into a small ditch drainage near the end of the road into a subalpine swampy meadow where the trail begins at around 1200 m elevation. 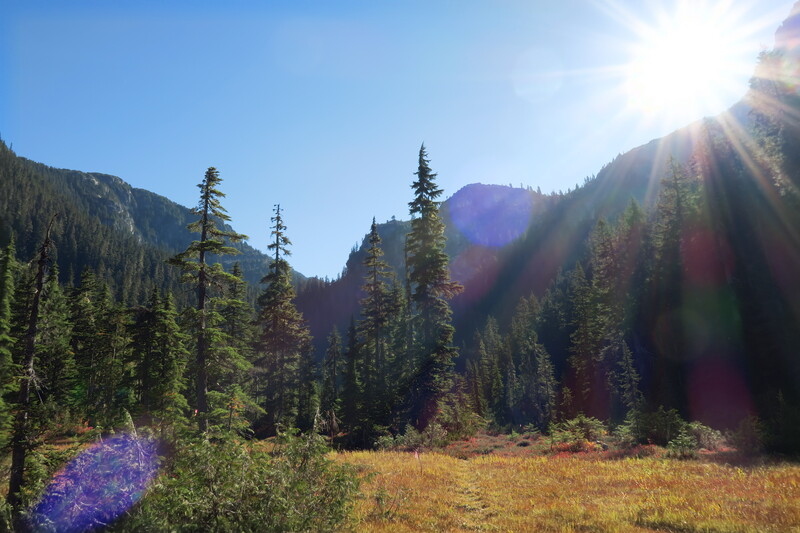 You meander through the meadow along a muddy track until you get near the end of the lower valley and ascend talus slopes and steep forest loam. Lower meadow when you first leave the road. Further up the valley into the very serene area. Beautiful. I was hoping to see some bears in the meadow, but there were none that I ran into that day. 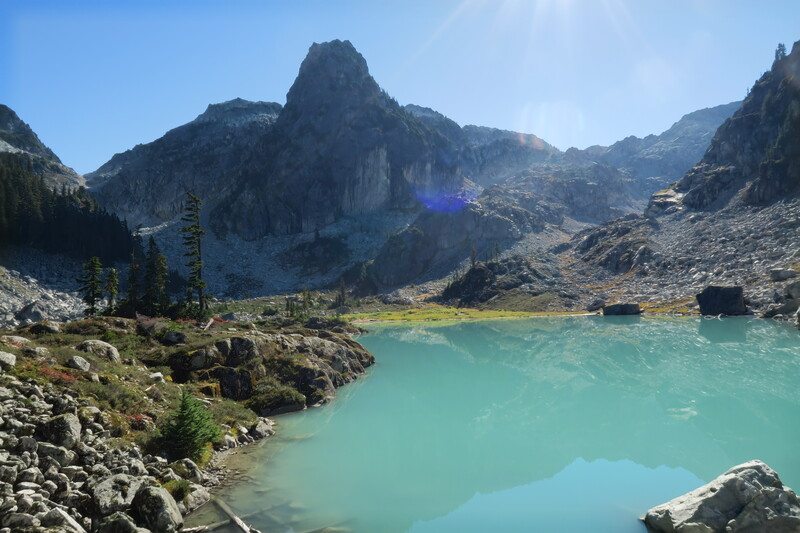 You immediately pop out by the turquoise Watersprite lake and a back drop with the North side of the Watersprite tower (not a true tower, more or an abutment off the main ridge forming the upper bowl. There was no beta or trip reports that I could find for the area above the lake. Martin Peak (1877 m) was the most prominent summit in the area so I decided that would make a nice objective. 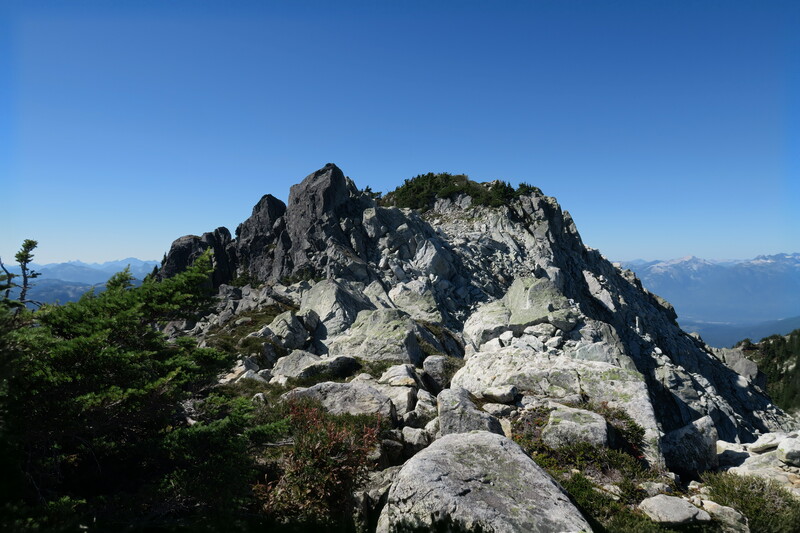 There was a small rounded, unnamed knoll (1800 m)to the west that I decided to climb first and then traverse over an tackle Martin Peak. 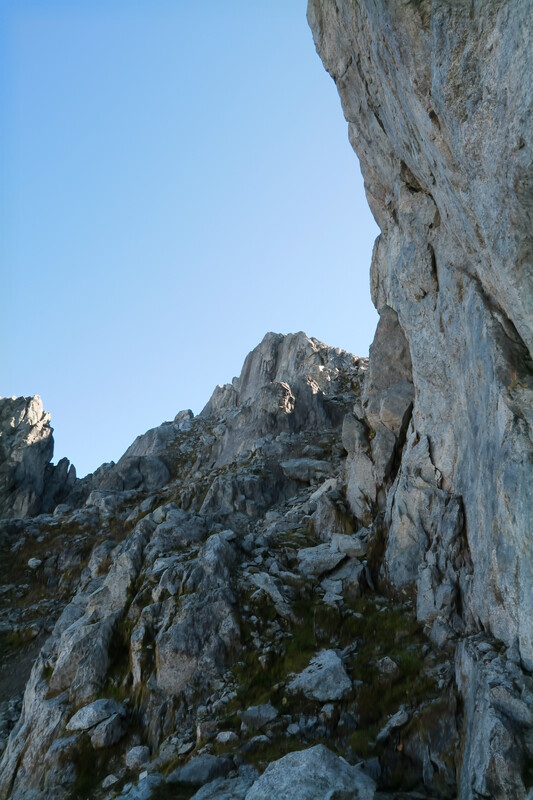 From the west, Martin peak has some pretty sporty lines and my first couple attempts stopped short of risky moves on uneven, loose footing, perhaps with a partner or a belay would make it easier, but on solo mission I decided to play it safe and find a route with better rock. Easy never ramp leading to up near the summit, but ended in a very loose gravel filled chute that fell away to the bowl below. 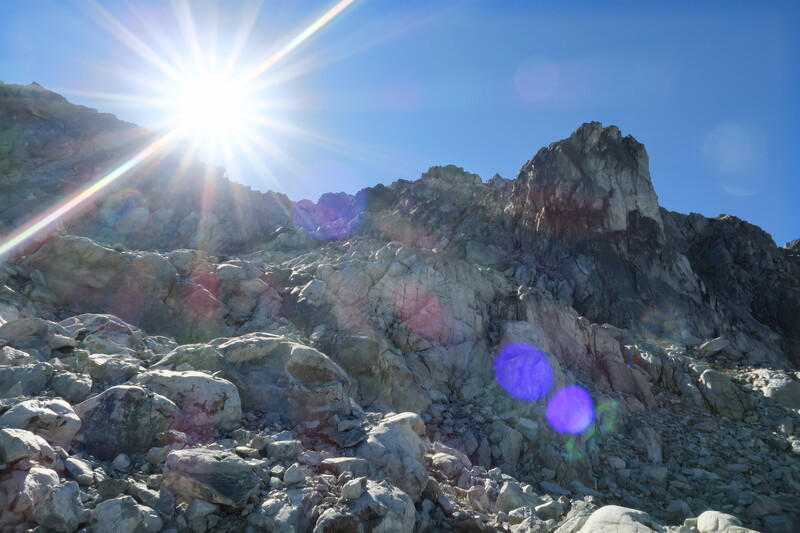 Fun Scrambly boulders made as steep or exposed as you want leading up to the summit ridge. 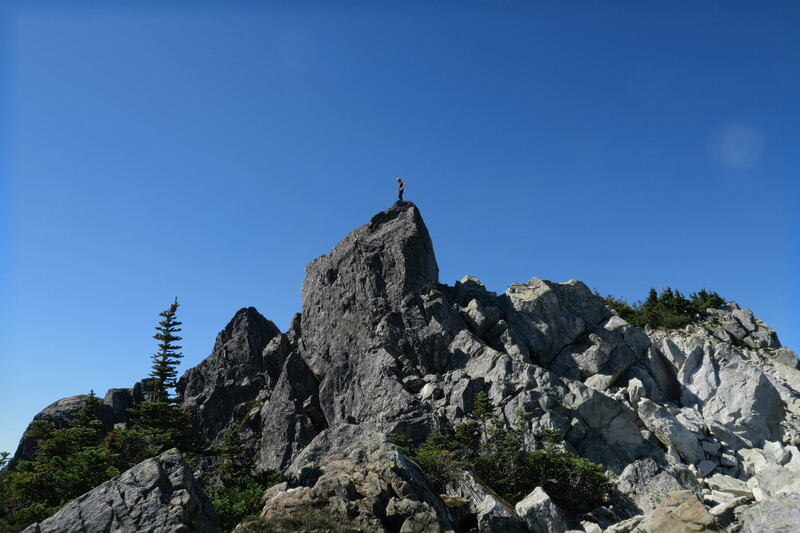 I dropped down bit in elevation and traversed under the main summit precipice that faced the lake and gained the NE ridge that lead to the summit. This was a choose your own adventure with some really excellent scramble boulder problems that were mostly optional depending on your level of confidence. I picked a sporty line to the summit but you could ascend a moderate route to the summit approach if you take the time to route find. There are no cairns, markers or footsteps visible on this route because of the very small number of people that visit this are–so far. It is getting more popular. Standing on the small pinnacle about 20 m below the true summit not visible in this angle. Picture of paradise taken from just below the summit to get a better angle on the most emerald green lake that I have ever seen (looking south). 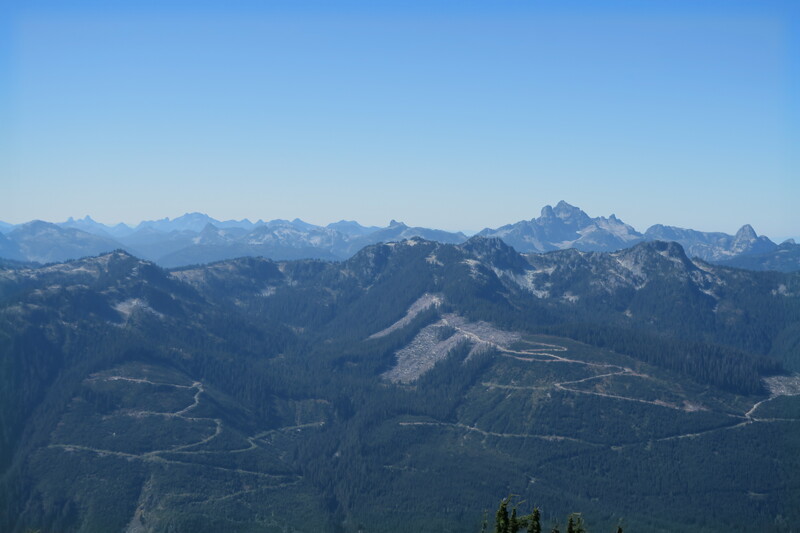 Down from the summit with Watersprite lake, Garibaldi, The Black Tusk and Little Diamond Head all visible. The very impressive Mt Mamquam. Winter objective for some great ski Mountaineering. 5 hr 30 min total moving time. **1/2 very fun and beautiful area. Plan an overnight at the lake and explore the whole alpine area the next day for more time. The Lions, Brunswick Mountain, Sky Pilot, Co-Pilot, Mt Habrich, Anif and Alpen peaks all visible. with some BC enhanced viewscape in the foreground. 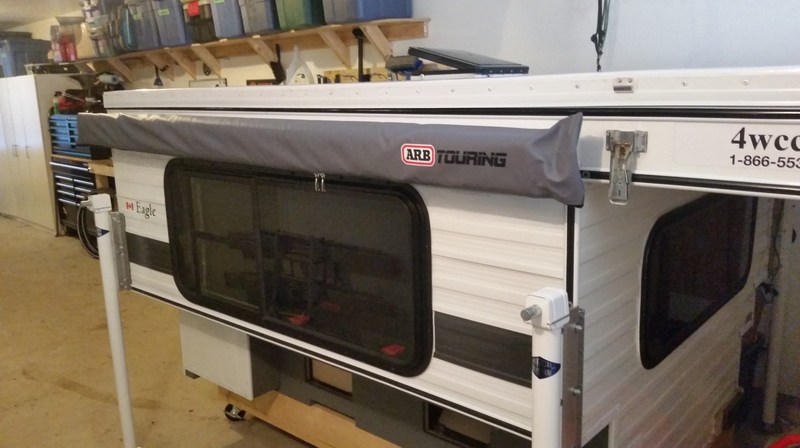 ARB makes some pretty killer 4×4 parts and accessories and the Awnings are a nice, simple, adaptable line that can be installed to most vehicles in a snap. 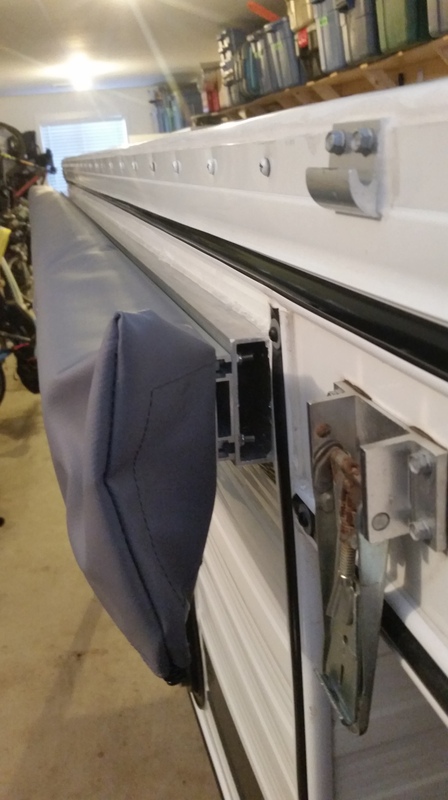 If you have a four wheel camper without a roof rack and want a really solid mounting arrangement, keep reading and I’ll show you what I did. 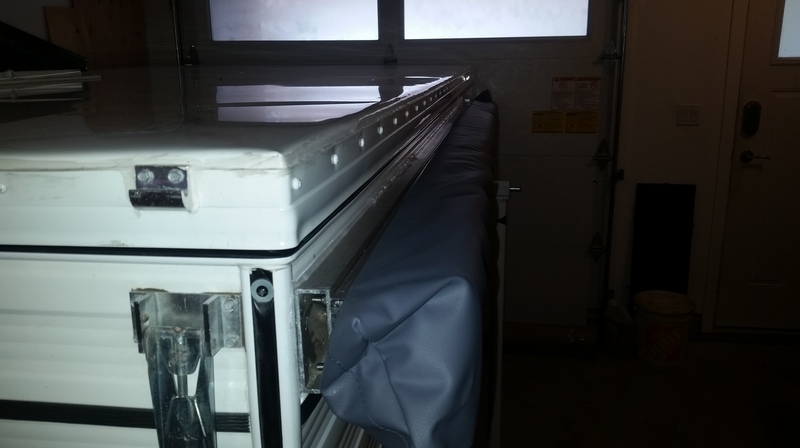 ARB seems to not have intended to flush mount the awning as it is designed with an aluminum extrusion that holds the bolt heads captive and nuts are put on from the back. This is designed for using brackets to attach to a wall or have the bolts go right through the wall with nuts on the inside. I did not like the idea of having the bolts penetrate into the camper interior since they would interfere with the bed storage and small interior cabinets. I also wanted the option to remove the awning easily. 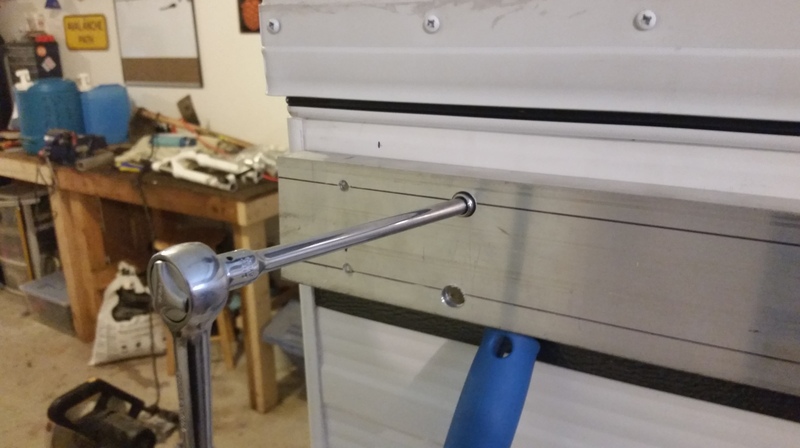 I purchased a length of 3″ x 1″ x 1/8″ wall x 78-3/4″ aluminum and drilled it to match the bolt locations on the ARB awning. 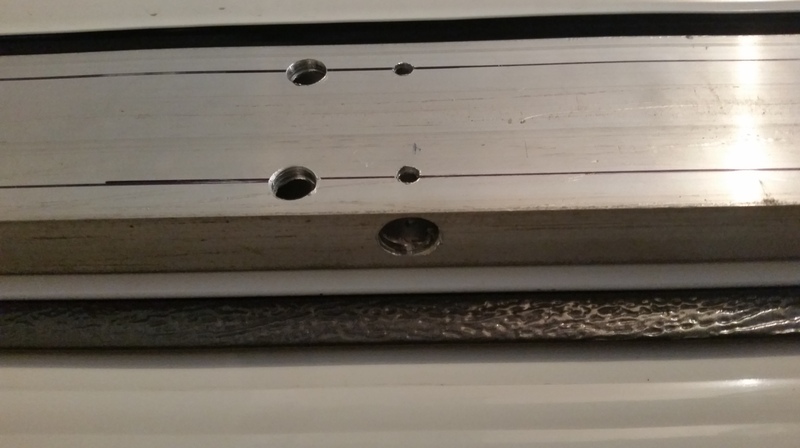 The bolts can slide in the extrusion so they can be located at any spot along the length. 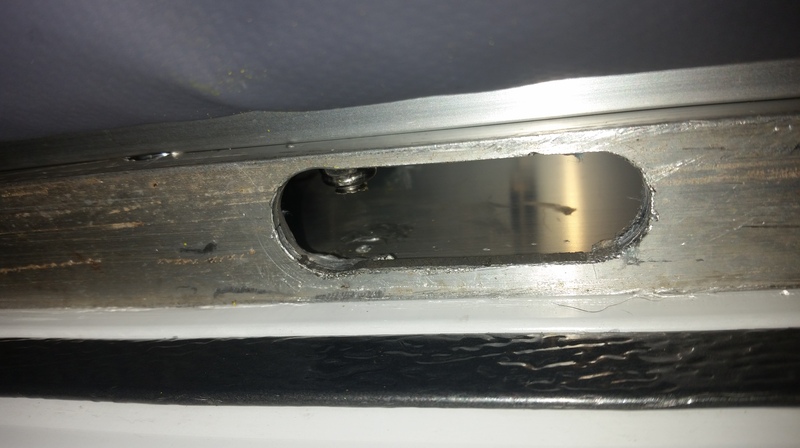 To mount the aluminum section to the camper, I drilled some clearance holes for #10 x 1″ stainless steel sheet metal screws. I used 12 in all, evenly spaced in two rows about 2 inches apart. I drilled 9/64″ pilot holes into the aluminum banding that runs the entire perimeter of the Four Wheel Campers at the top of the framing. Clear, 100% Silicone RTV Adhesive Sealant was applied around the entire length of the mounting surface and around all of the holes in three beads. I applied a final finishing bead at the top where the Aluminum meets the siding on the camper for another level of protection. Attaching the awning to the mounting piece was a bit tricky to get access to tighten the lock nuts on the bolts. I cut an extra access slot for the middle bolts, but could only get at one, so the Awning sits mounted with 5 total bolts, ARB recommends a minimum of 4. It is very stable as is so I don’t have any worries. Sometimes you just have to get out and enjoy the rain. 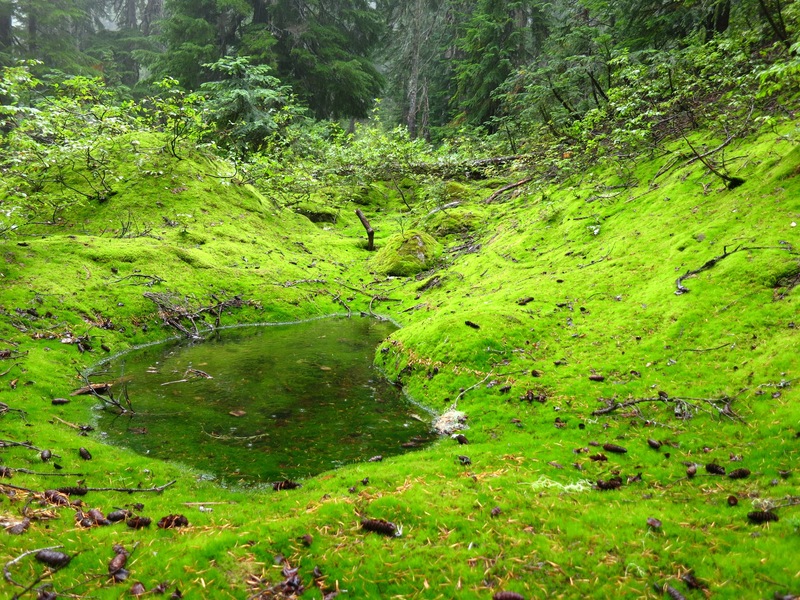 Life is returning to the Forest with the late summer rains.